The issue of transparency and accountability for teachers' vacation was dramatically reduced by the government-issued RC Number 83. Teacher unions are a vicious conspiracy to apply to the school educator and apply to the complex principal of teachers. Asked if the system was run by the conspirators and the machinations. The teachers unions have been saying that the government does not follow the transparent procedures and that there is no clarity on the Cadre Strength. 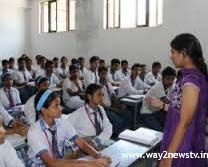 There are various types of experiments on government schools, Residential, Gurukulas, Social Welfare Schools, SC Welfare Schools, Estuary Welfare Schools, Minority Schools, Model Schools and KGBs are asking schools to quit schools in the villages and do not have any education in villages. They claim that each Gazetted Officer is to work as a school HMG and mandal educator and to appoint teachers based on children in school rather than the number of children in the village, and that the government does not care about these issues. Three years have passed since the Telangana government has not implemented service provisions, and the government has not taken any steps for the teachers' appointments, alleging that the government has not issued orders and proper staff on Telugu medium and Telugu language implementation.